Last school holidays I visited Vaucluse House with one of my aunts. During the mid-semester break few weeks back my mum’s other sister joined us for an outing to North Head. We found the one day we were all free and it happily turned out to be a beautiful day – clear blue skies, warm but not hot. To help give you a picture of where North Head is (for those non Sydneysiders in my audience!) I’m going to give you a crash course in geography. When we think of Sydney Harbour, most of us think of the Sydney Harbour Bridge and the Opera House. These two monuments are on either side of a small inlet known as Circular Quay, about ten kilometres (6 mi) from the ocean. Just west of the bridge, Parramatta River and Lane Cove River meet. East of the bridge the waterway opens into Sydney Harbour. The eastern edge of Sydney Harbour is a spit of land called South Head which separates the harbour from the Tasman Sea (which is part of the South Pacific Ocean). Middle Harbour and North Harbour (Manly) meet Sydney Harbour at Sydney Heads. North Head sits between North Harbour and the Tasman Sea. There is a two kilometre wide span of open water between North and South Head. This is where Sydney’s three harbours meet each other and the Tasman Sea. The waterways combined (the three harbours and two rivers) are together called Port Jackson (named by Captain Cook in 1770) and form the largest natural harbour in the world. Port Jackson from the air: looking east from Darling Harbour to Sydney Harbour Bridge and across Sydney Harbour, as it curves north (left) up to Sydney Heads – then out over the Tasman Sea. Enough geography and history – back to our outing! As I said, it was a beautiful day. We had lunch at a cafe on North Head, at an outdoor table with a view across the channel to South Head. It was an absolutely beautiful view – I found myself distracted from our conversation a few times! Then it got better. We spied a whale (probably a humpback) frolicking in the waters! There was a lot of tail slapping and spouting, no breaches. We later saw a local newspaper inside the cafe with a front page story on a whale with her calf spending time off the coast nearby the day before – and wondered if we’d seen the same pair. Thousands of whales travel past Sydney each year, and sometimes a few will take time to rest near shore where they delight onlookers. It was my first time to see a real life whale, albeit from a distance. What a lovely treat! After lunch we headed off to a walking track around the edges of North Head. The views were spectacular! The rocky cliffs, with their windswept sandstone. The deep blue of open ocean. The contrast of fire-blackened banksias against that blue backdrop. The view across the heads and Sydney Harbour toward the city centre itself. Standing there, with my aunts, soaking up the views, sun on my face and wind in my hair – it was hard not to love this city I’m in! 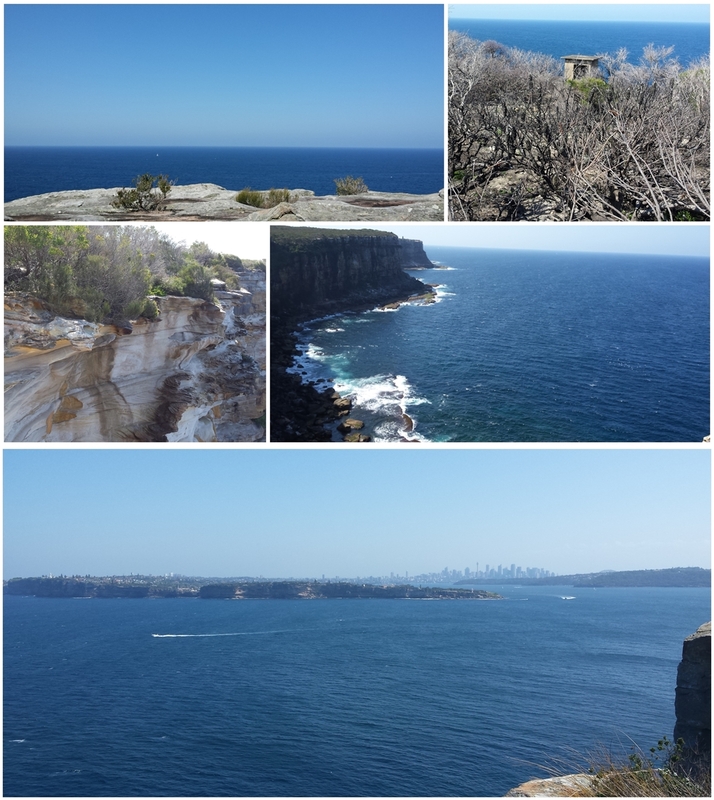 Views from North Head – north up the coast, into the Tasman Sea, and across South Head and Sydney Harbour toward the city centre. I was fortunate enough to live on South Head at the Navy Base HMAS Watson when I was little. It was absolutely amazing! Especially when we could watch the Sydney to Hobart start from our front deck and then go to a friends place that was on the other side of the base and watch them sail off into the horizon.